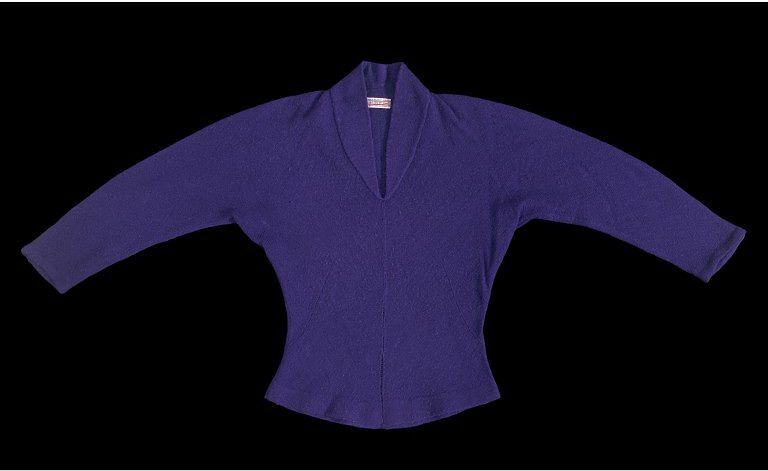 This 1950s purple sweater has a fashionable open neck and three-quarter length sleeves. Casual clothing inspired by sportswear was worn by American teenagers before being introduced into Britain. 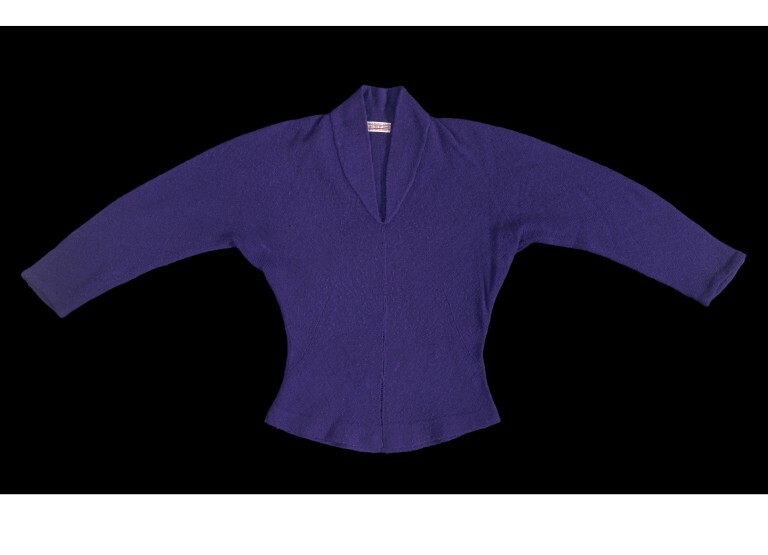 Although by this period much knitwear was machine-made for the mass market, the label on this jumper declares that it is a hand-knitted product of 'Women's Home Industries'. Jumper of hand-knitted purple wool. With an open neck and three-quarter length sleeves. 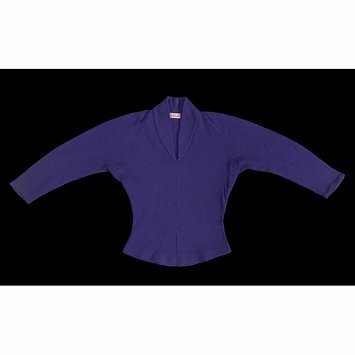 This waisted sweater with dolman sleeves, 'V' neck and attached collar is deceptively simple. The front and back, including the sleeves, are each knitted in one piece. The 'cut on the cross' effect of diagonal stocking stitch is achieved by decreasing stitches at the centre front and centre back. The sweater is hemmed at the lower edge and wrists. The couture designer Edward Molyneux was so impressed when he saw this design that he gave permission for it to be named after him. The Womens Home Industries was a post-war offshoot of the Women's Voluntary Services. The organization, formed originally to make 'comforts for the troops', was run by Lady Reading and employed hand-knitters all over Britain.It quickly became known for its high quality fashionable garments and by 1950 was exporting to the finest shops in the United States. Its designer, Beatrice Bellini, now carries on the business under her own name.